When I first started to get interested in home brewing, I spent a lot of time flipping through home brew books trying to determine what equipment I needed. Before I could get started home brewing, there was a lot necessary equipment that I was going to need. I also spent a lot of time browsing through the home brewing supply shop websites before I figured out what I really needed. Is It Better To Buy Equipment Kits Or The Parts Individually? Most home brewing stores sell the equipment by the piece or as sets. 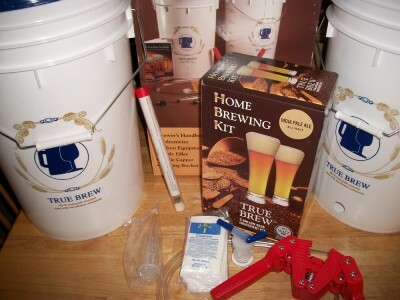 The equipment kits that include everything that you need to get started for brewing beer except for the brew kettle, the carboy and the bottles. When I first started home brewing, I bought a kit for two main reasons. The kits were cheaper than buying everything individually and even more important was that I knew that I was getting everything I needed. The home brewing world can be pretty overwhelming when it comes to all of the jargon and technical equipment, however with the kit at least I knew that I was going in the right direction. However, buying the pieces of equipment individually does have some advantages. You can get exactly what you want and nothing that you won’t use. Maybe you want to spend some extra dough and get a glass carboy instead of the plastic fermenting bucket that most home brew kits come with. Or maybe you already have some of the equipment laying around the house and you don’t need the entire kit. I would recommend starting with a kit, then upgrading as you go on. Here’s a few kits that have all of the equipment that you need. Some even come with recipe kits, so you’ll be ready as soon as the UPS man knocks on the door. Basic Home Brew Beer Brewing Kit with 5-gallon India Pale Ale (IPA) Beer Ingredients Included My very first kit and one that I can recommend to any novice brewer.